Collect and analyse vibration data as fast as never before with Vib Cloud. Prolong your equipment life and reduce downtime at a low cost. Vib Cloud is an end-to-end solution that enables you to quickly collect and analyse vibration data. Install the Vib Cloud mobile app on your Android or iOS device, connect vibration sensor and instantly collect and diagnose machine data. View actionable insights, perform in-depth analysis and deliver professional reports from your web browser. Save time on data collection and on-the-spot diagnosis. Our vibration measurement algorithm is engineered from scratch for fast performance. 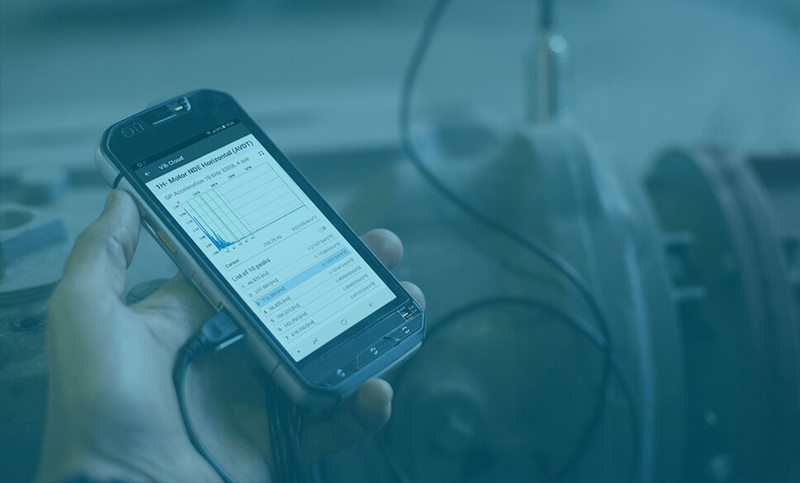 The Vib Cloud mobile application collects vibration data and simultaneously performs Fast Fourier Transform (FFT) and assessment of severity against ISO 10816. Take reliable, high-quality vibration measurements with the tap of a button. Vib Cloud performs best with Digiducer 333D01 - a high-resolution, broad-frequency piezoelectric accelerometer. The Digiducer sensor comes standard in the Vib Cloud product packages. Vib Cloud also supports different ICP sensors upon request. Get peak performance with today’s latest mobile platforms. Vib Cloud apps run on the latest mobile hardware and operating systems, not outdated, sluggish proprietary devices. We guarantee to stay compatible with the latest version of Android and iOS, so you can always get the most out of your mobile device. Perform in-depth vibration analysis and get actionable insights in the blink of an eye. Vib Cloud was built for the cloud, not simply moved to the cloud - analyse vibration data in true detail in any web browser at unmatched speeds. The Vib Cloud mobile app stores collected data directly in the cloud - no additional hardware or software needed. Benefit from simplified ownership of a hosted end-to-end solution. Vib Cloud eliminates the costs of building, maintaining, securing and supporting your own IT infrastructure. Minimize on-boarding and training costs - get a Vib Cloud account, enroll users and immediately start collecting and analysing vibration. Start small today, invest with the growth of your business. Get started with one of the Vib Cloud product subscriptions. Purchase additional user subscriptions or vibration sensors at a transparent price at any time. Stay in control with an open solution that doesn't pose restrictions. Leverage your existing investments in hardware and partnerships - Vib Cloud gives you the freedom to use your own mobile devices and vibration sensors. Analyse vibration data yourself or outsource analysis to experts. Use Vib Cloud as a core instrument in your predictive maintenance service offering. Pick up early deviations, plan repair actions, help your clients reduce downtime and sharpen your competitive edge. Use Vib Cloud for on-the-spot quality checks of equipment installations. Measure before and after repair to guarantee and sign off quality. You will benefit from fast measurement speeds and reporting capabilities. Vib Cloud’s on-the spot diagnosis is an indispensable weapon in your tool belt when you are called to one-off equipment inspections to supplement diagnosis of a broken machine with vibration data. Improve quality of products after equipment refurbishment. Check vibration condition after repairs and issue certificates to guarantee quality for your customers with Vib Cloud. To cut costs while improving quality of their service, a condition monitoring service provider has decided to offer a remote condition monitoring program including vibration analysis to all clients through the Vib Cloud hosted solution. A small manufacturing plant reduces condition monitoring costs and the time to get hold of condition monitoring reports by moving previously outsourced activities in-house with Vib Cloud. Starter package for vibration measurement and on-the-spot diagnosis: Includes mobile data collection app. Separately order Digiducer vibration sensor or digital signal conditioner to use your own ICP sensors. Comprehensive vibration measurement & analysys package Includes mobile data collection app, sensor and full analysis and management in the cloud.